Are you opening it through Unity and the "Open C# project" menu option in that, or just directly in visual studio? The thing about Unity projects is that they aren't actually standard C# code and you can't just compile them with VS. There does not appear to be an "Open C# project" menu option in this version of Visual Studio (perhaps because I'm developing this on a Mac?). Is there another way to open it? Edit to edit: found out that I was opening the wrong Unity. Now I can see the window you are showing there, but I cannot find where the scripts are that actually contain the code! In the Unity "Assets" menu there should be an "Open C# project" option at the bottom which will open visual studio with a connection to the Unity editor, which will allow it to read and compile the scripts properly. All right, got that. Now, how does Unity attach each script to each element in the hierarchy? For example, I am looking at the object entitled 'Liberal Agenda' in the hierarchy, but I don't see any reference to LiberalAgendaImpl or any of the other script elements. How are these connected? On that object are two components, the Rect Transform (which is a default component that will be on every UI element) and the actual Liberal Agenda Impl script. 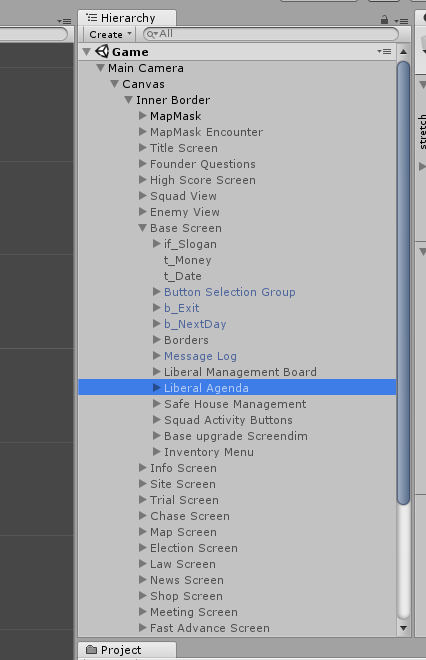 The various things inside the second component are all the hooks for the public members of the class - basically this is how Unity sets the default values of a monobehaviour instead of using a constructor. So for a few examples, the UI Controller is, in the script code itself "public UIControllerImpl uiController;" - just being public exposes it to the Unity interface. Then it's set by just dragging in an object that has on it a UIControllerImpl component (in this case, the MasterController object that's farther down the hierarchy window). Not all of those references are to other objects in the scene - some of them might be image or prefab references being pulled from the asset explorer in the project tab in the bottom right. If you want to see where any of the actual referenced objects are, you can just click on them once on the LiberalAgendaImpl component and it will highlight it in the hierarchy/project window. 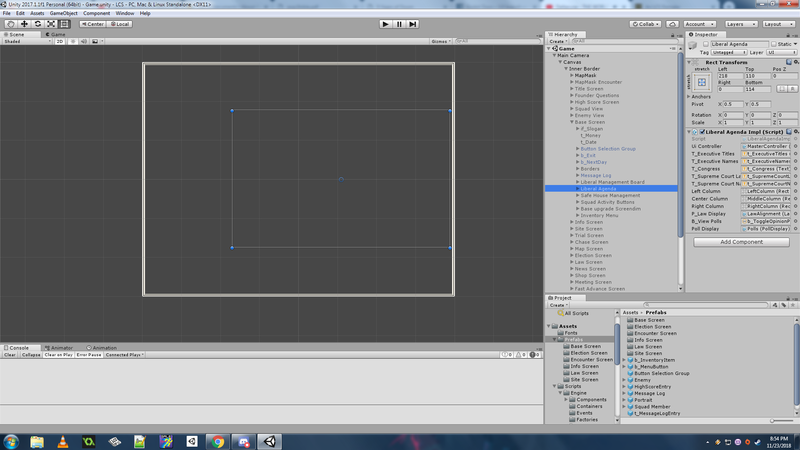 You might want to look up some basic Unity tutorials if you want to dig into editing the code/interface itself. Basically everything I did was very simple usage of the built in UI system, which is mostly playing with layouts, and then having some master objects to handle all the logic and read data from the game state to feed into the UI. I just posted a thread (link) about the new game I want to design and leave for discussion as to which version of LCS to start with to modify from. I can't figure out any pattern about what causes it, but sometimes upon attempting to leave areas (I've had it happen with at least the courthouse and the garment place with differing characters), the game locks up when I walk onto the exit tile. The only thing I can do at that point is close the game and re-load, and it loads me to before entering the area, but I've had it happen a couple times where the save seemingly corrupts, and loading it just produces a black screen. Further, if the save didn't corrupt and I attempt to go back to the place where it locked up, it'll lock up again. I did this with the garment place about 5 times in a row before I gave up and just did another activity. Another thing: Sometimes when I leave an area it'll have conservatives chasing me, but it sort of just immediately skips that and I flee without having to actually do anything. I've never seen it not just skip over that. Not a very critical bug, but still weird. I'm on Windows 10, using your Windows version. Next time you get the black screen can you post the output_log.txt from C:\Users\(your username)\AppData\LocalLow\Lazy Dog Software\LCS (You might need to enable hidden files to be able to see it)? It sounds like there might be an uncaught exception which would be recorded in there. Your save file is also in that folder and might also be helpful. Yeah, I kept the save of the most recent one, where it messed up when my character Alias'd as "Suave" tried to leave the courthouse. KeyNotFoundException: The given key was not present in the dictionary. Would it be possible for you to make it so the game keeps a backup save in addition to its main save? To mitigate corruption ruining saves. I've posted a quick update that addresses your issues - I'm not really sure what was causing the crash when you were exiting a site since I can't seem to reproduce it, but it might have been related to the save corruption. The new version should be able to correctly load your save now - there was an issue of an item recorded in a safe house inventory that no longer existed in the save. When you load it now the game will just purge the bad reference and continue. I've done Android builds from Unity before, I could have a go at making one for this. However, to work well with touch-screen, all keyboard shortcuts should also be exposed as clickable elements on the UI. It's not going to go well on a phone if you need to keep accessing the Android keyboard. I wouldn't mind even a hook for a hardware keyboard. Bluetooth. Or a gamepad and selectable options but that's tougher. It should handle a bluetooth keyboard automatically. Android handles that at the operating system level, so apps/games don't have to do anything about that. The main thing is that to do an Android build from Unity you have to download and install a stack of stuff including the official Android SDK, and that takes a bit of homework to get it all working. I was originally skeptical about the graphics (the game having graphics, I mean), but there is something about this version that just a tad bit more addictive than the original. The little touches that you've done with the graphic interface is what really intrigues me, like how the managing liberal section looks like a police cork board of known associates from cop shows, or how equipment has descriptions and pictures. EDIT: Would it be possible to bring back the Ride of the Valkyries music for the Car Stealing scene? For some reason, it just seems iconic to me. EDIT2: The game sometimes crashes if I try to rent a room. It also seems to be less stable the longer I play. EDIT3: Ok, the game didn't crash this time when I rented the room, but it keeps crashing when the cops raid my abandoned safehouse. Can you post a copy of the output_log.txt and your save from the folder C:\Users\(your username)\AppData\LocalLow\Lazy Dog Software\LCS from after a crash? Also is it an actual hard crash to desktop?